Yeh, this one is really bad. Walking down the street in Delray Beach I came across these little beauties. The poor Clintons, they will never live this down. My favorite parts? Oh that is easy. Bill: Warning could create Pinot Envy. Oh I laughed all the way down the street on that one. Hill: Stainless steel thighs. Really, what more can you say about that. I would have bought these to add to my collection of stupid items but at 19.99 a piece I simply found them too pricey. Hey, a girl has to set limits. Ummm…. 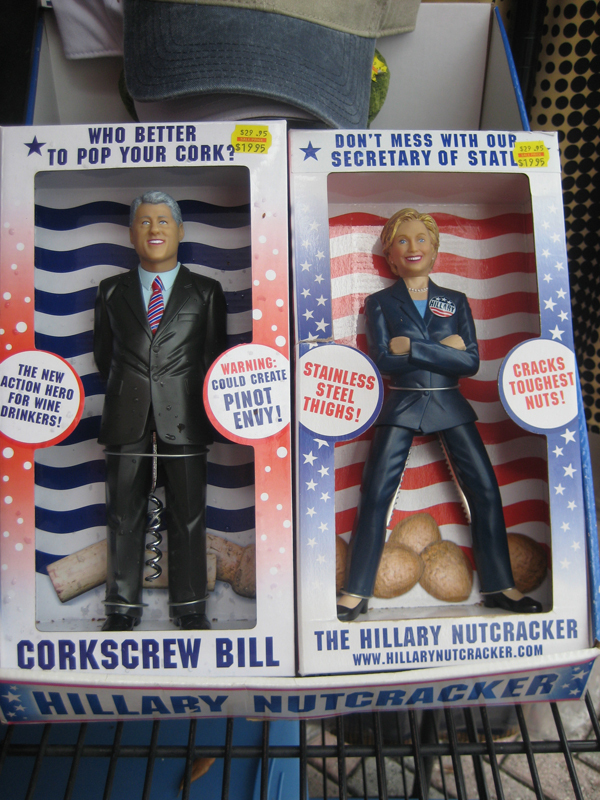 I own two of the Hilary nutcrackers. 2 Hillarys, no bill. Interesting equation Jessica. Hillllaryious. Couldn’t help myself, sorry! i LOVE the demo of how she works. i may have to break down and buy these.